After finishing the first in the Millenium trilogy (The Girl With the Dragon Tattoo) I immediately picked up the sequel, so gripping is this series. The sequel, The Girl Who Played With Fire is quite a different novel from the first in the series. Much faster paced. The first book is a slow burner, a long journey to uncovering a mystery. The second is a fast paced action thriller, there is hardly any let up which meant I simply couldn’t put the book down! The character of Salander is developed much further and the more you find out about her as a reader, the more you come to admire her and like her, despite her quirks. Blomkvist remains a great ‘everyman’, stable and reliable throughout. 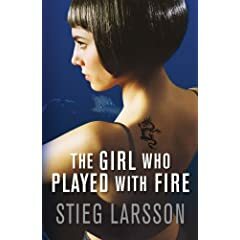 One of the girlfriends Salander hung out with in the first novel comes to the fore in this one, plus an array of new characters involved in the investigations. It’s very difficult to write a review of this book without giving away something of the fantastic plot. So I think I shall leave it there and just say that even if you don’t like crime fiction, you would enjoy this. Has the pace of the Da Vinci Code but is a million times better with regard to literary style!